In the far southern reaches of Pleasant Township, just as one approaches Baum's Bridge over the Kankakee River, once existed the small community of Mayville. Mayville was situated in the southwest quarter of the southeast quarter of Section 26 Township 33 North Range 6 West. This township is generally unsusceptible of cultivation. The Kankakee river is a rather sluggish stream, its banks very low and lined on each side with a heavy growth of timber, mostly ash, some elm, maple, oak and birch, which grow very tall, and is undergrown with swamp alder and wild rose, etc., making an interminable forest which is covered with water during the season. The soil in this forest or swamp is loose yellow sand which renders it almost impracticable to approach the river, only when the swamp is frozen. In the marshes on the north part of the township are large beds of rich iron ore.
A Native American trail crossed the Kankakee River at Baum's Bridge that early pioneers referred to as Pottawatomie Ford. 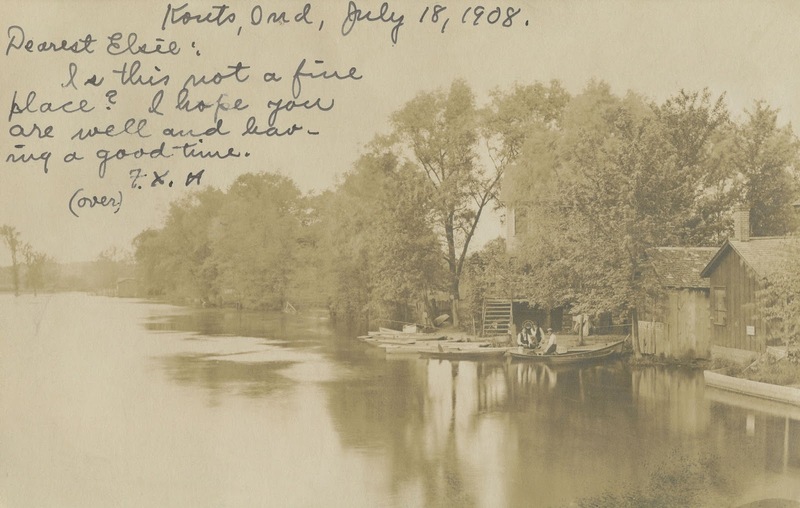 Settlers John Ship and Joseph Stearns would briefly operate an unlicensed ferry across the Kankakee River at Pottawatomie Ford, which was soon purchased by a Mr. Sherwood, probably Jerry Sherwood, and renamed Sherwood's Ferry. in Section 26 in the center of this image. Uriah Biggs, Deputy Surveyor, 1834. 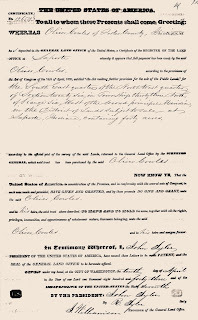 Individuals issued land grants from the United States General Land Office that would later be encompassed by Mayville included Oliver Cowles (40 acres on April 10, 1843), Lambert C. Cowles (40 acres on May 1, 1848), Leonard B. Cowles (40 acres on May 10, 1848), and Wilson Malone (approximately 160 acres between August 1, 1844 and December 27, 1850). land would later be embraced by Mayville. Source: United States General Land Office. Oliver, Lambert, and Leonard Cowles were brothers, the sons of Gamaliel and Tempy (Atwater) Cowles of Connecticut. The brothers were pioneers and well educated, Leonard earning a degree from Yale University. 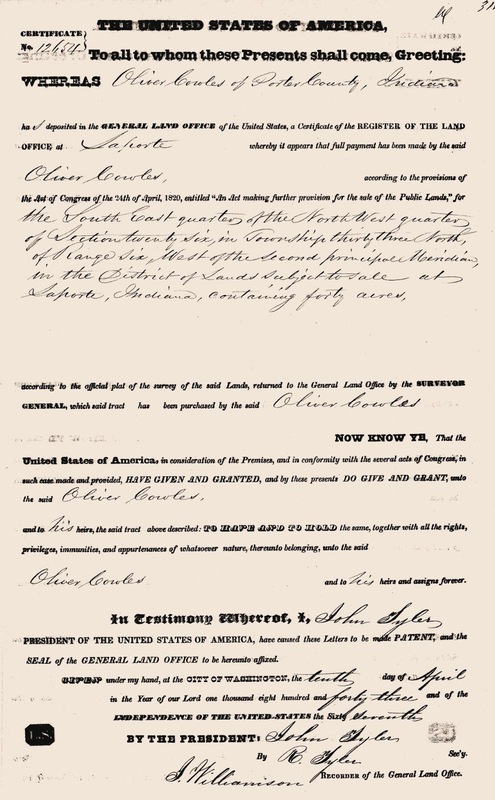 It is believed that the brothers were also real estate speculators, purchasing land as it became available through the United States General Land Office. Oliver is the only brother known to have resided in Porter County; he was one of the first permanent settlers of Pleasant Township. Oliver passed away on Thursday, September 14, 1852, in Pleasant Township as a result of dysentery at the age of 72. The location of his burial is unknown. Wilson Malone was born in Ross County, Ohio, on June 18, 1805, the son of Lester Malone. Wilson married Sarah Swank in Montgomery County, Indiana, on February 22, 1832, and in March of that year they moved to LaPorte County, Indiana. Malone reportedly arrived at LaPorte County with "a few household goods and 50 cents." He obtained a contract from the state to build one mile of the new Michigan State Road, known today as U. S. Route 421, between Michigan City and the town of LaPorte. He used the proceeds earned from this road building work to invest in land in Porter County, including land in the Mayville area. He was an industrious individual, owning more than 1,100 acres at the time of his death on December 22, 1876. Each footman, 6¼ cents; man and horse, 12½ cents; horse and Dearborn wagon, 25 cents; two horses and wagon, 37½ cents; one yoke of oxen and wagon, 37½ cents; four horses and wagon, 50 cents; each head of cattle, 6¼ cents; each sheep, 3 cents; each hog, 3 cents; each horse, 6¼ cents; asses and mules, each 6¼ cents; and when water is high, so that the ferry would have to run up to the head of the canon, three times the above rate were charged. Eaton ran his ferry business for ten years. 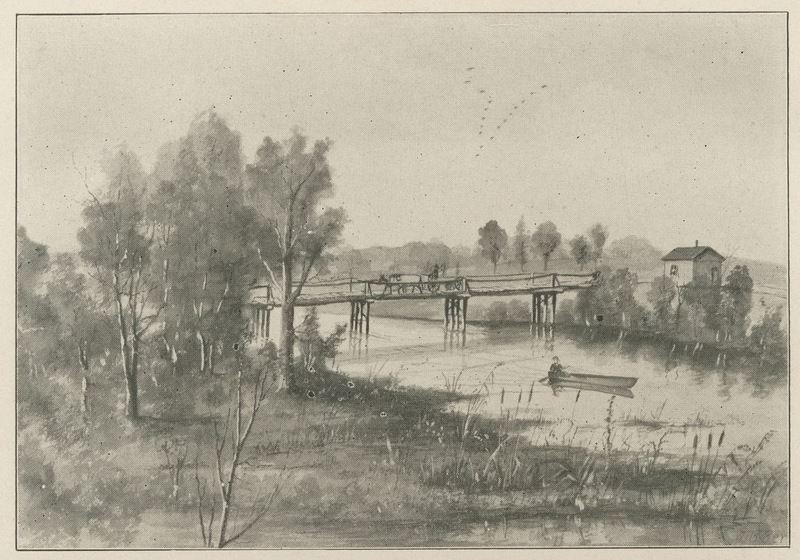 In the winter of 1849, however, he constructed a toll bridge at his ferry crossing. 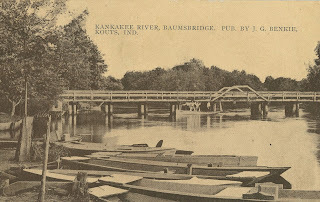 This was the first bridge to cross the Kankakee River up river from Momence, Kankakee County, Illinois. 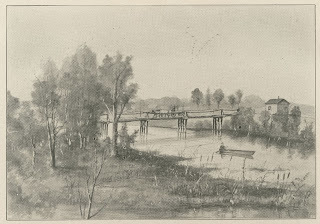 A fire destroyed Eaton's bridge during the summer of 1850, supposedly by an arsonist who was disgruntled with the fact that a toll was required to cross the river. today the river is spanned by Baum's Bridge at this location. Source: Werich's Pioneer Hunters of the Kankakee, 1920. After the destruction of the bridge, Eaton would return to ferrying passengers, animals, and cargo across the river until he died in 1851. Eaton's wife continued the ferry operation until she passed away in 1857. The husband and wife are purportedly buried on a small knoll overlooking the ferry landing. Map showing approximate location of Mayville in Pleasant Township. Source: E. P. Abbot's Sectional Map of Porter County, Indiana, 1855. A Mr. Sawyer came into ownership of the ferry landing soon after Mrs. Eaton's death in 1857 (this may have been Henry B. "Honey Bee" Sawyer), and in that same year he constructed a new bridge crossing the the Kankakee River. Sawyer's bridge existed for less than one year. Spring flooding and ice damming destroyed the structure in 1858. Sawyer did not rebuild his bridge, but instead continued a ferrying business across the river. He sold his interest in the business to Enoch A. Baum in 1860. Note that some sources indicate that an Enos Baum bought Sawyer's interest in the ferry, but no records exist showing that an Enos Baum ever resided in Porter County or had descended from the pioneering Baum family of Washington Township. Enoch A. Baum would then build the third bridge over the Kankakee River in 1863. Baum's structure was more substantially constructed than either the Eaton or Sawyer bridges and it lasted for many decades. At the close of the Civil War, Jasper County and Porter County secured joint ownership of the bridge over the Kankakee River. 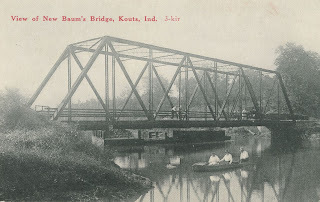 To this day the crossing is referred to as Baum's Bridge and the road leading to the crossing was named Baum's Bridge Road. A steel girder structure replaced the 1863 wood bridge built by Baum, which itself was replaced in 1925; the 1925 bridge structure involved dumping fill under the steel girder bridge, removing the older bridge, and then installing 175 foot long concrete head walls on which the crossing deck was constructed. River, located directly south of Mayville, circa 1910. Photograph likely taken from the Louisville Gun Club site. This was the third bridge to span the river at this location. the fourth bridge to span the river at this location. Mayville was laid out as a village in 1870 by Captain William F. W. DeCoursey, a civil engineer and surveyor. DeCoursey, a native of England, was residing in Valparaiso at the time he surveyed Mayville. No recorded plat for Mayville is known to exist within the recorded documents of Porter County. The village derived its name from a picnic that had been held along the north shore of the Kankakee River on May Day (May 1st). DeCoursey would later plat the village of Hageman, which eventually evolved into the Town of Porter in Westchester Township. Prior to being laid out as a village, the general area around Mayville was derogatorily referred to as Deserters' Paradise during the Civil War. It was a relatively easy place for deserters of the war to hide given the ruggedness of the land, the extensiveness of the marsh, numerous islands, and rather abundant timber. Map denoting the location of Mayville in Pleasant Township. Less than one-half mile directly west of Mayville was a site interchangeably referred to by pioneers as Indian Gardens, French Gardens, and Bachelor's Heaven. 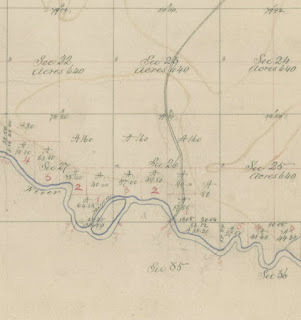 Specifically, the area was located in the southeast quarter of the northeast quarter of Section 27, or southwest of the intersection of present day county roads 1025 South and 100 West. Authors of early county histories speculated that a French military post was erected at this site in 1760 called Fort Kankakee, which was abandoned in 1763 with the signing of the Treaty of Paris. The site included of a very large mound of rammed earth and what appeared to be defensive earthen walls near the mound. The Ouiatanon Documents, however, place the small French fort one mile northwest of the large mound (in Section 22 of Pleasant Township) and not immediately west of Mayville. Henry Elmore Brody, a lifelong bachelor who died at Kouts in 1935, resided in the area of the large mound and was the source of the Bachelor's Heaven moniker. In 1908, Charles Wilcox excavated at Indian Gardens and unearthed six skeletons. A scientific excavation of the mound in 1931 by John Gilbert McAllister resulted in the discovery of six additional skeletons and numerous Native American artifacts. Given the evidence, it was believed that the mound was constructed by Native Americans as a burial site rather than by the French military or traders. The site is now commonly referred to as Weise Mound after Albert Weise, owner of the property in the early 1900s. Despite being laid out as a townsite by Captain DeCoursey, no deeds are recorded showing that lots in Mayville were ever sold. It has been written, however, that the following individuals made reservations for lots in Mayville: John G. Benkie, James Donahue, George E. Kelley, Stephen Mockler, William E. Pinney, Ezra Reeves, Eleazer Starkey, and George W. Wilcox. Individuals began to inhabit Mayville during the 1870s, mostly being hunters, trappers, and fisherman. They would erect log cabin homes in the community, but no effort was made to create and dedicate roadways. One of the first structures built in Mayville was a tavern. John Hickman would erect and operate a sawmill in Mayville. The lumber and boards were used to construct sheathed homes that replaced the crudely constructed log cabins. One source states that "only the less daring and the mentally slow individuals were available to work at the [Hickman] sawmill, and as a result accidents became an all too frequent occurrence." However, James M. Pugh, a Welshman with a background in sawmilling, would arrive at Mayville and find an opportunity to purchase the sawmill at a good price. 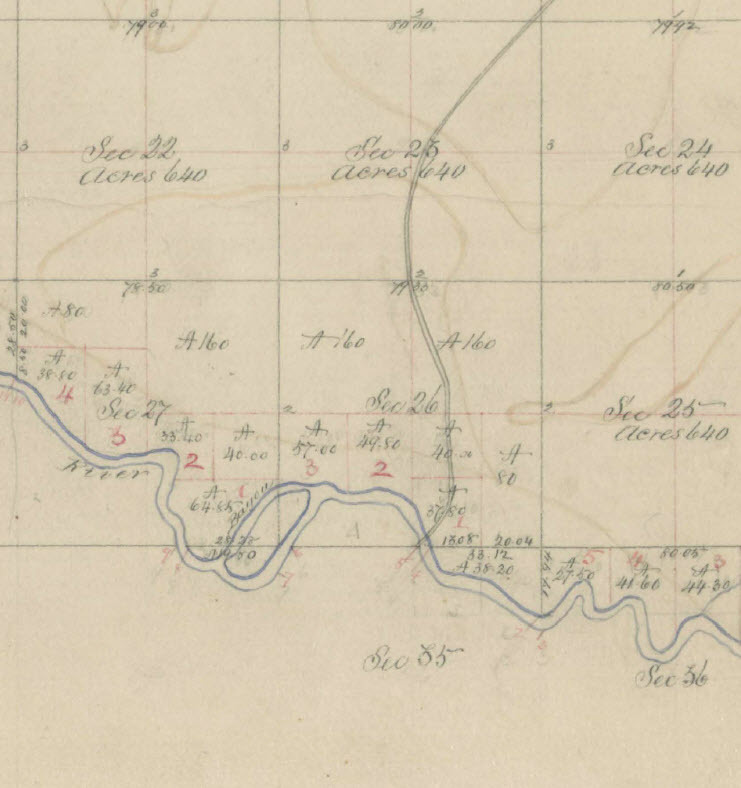 The Pugh sawmill appears on Hardesty's 1876 plat map of Pleasant Township. Soon after purchasing the sawmill, the Pugh family would experience a tragedy. On Monday, May 17, 1875, James' daughter Sarah was in a field assisting one of her brothers in burning off straw. Sarah's clothing would catch fire and cause severe burns. Her brother burned his hands trying to extinguish the fire. Sarah would die the following day due to her injuries. She was interred in Spencer Cemetery near Kouts. Death notice published concerning Sarah Pugh. Source: Porter County Vidette, May 20, 1875. Obituary published for Sarah Pugh. Source: Porter County Vidette, August 26, 1875. Mayville would grow very slowly from 1870 to 1890. The community could boast of having a tavern, dry goods store, church, and a school. A post office, however, never operated in Mayville. For a short period of time, Mayville had a constable named Jake Calligan. A source states that "Counterfeiting, horse stealing and highway robbery were in visible existence, but just as long as criminals let the local folks alone Jake let them alone." During the 1890s, the population of Mayville began to decline, most likely due to the hardships associated with living in an area surrounded by an enormous marsh. The quality of the water supply was also reported to be questionable. An example of news items from Mayville in Pleasant Township. Source: Porter County Vidette, March 8, 1877. As previously mentioned, Mayville did have a school. The school appears on the 1895 and 1906 plat maps east of the site of Mayville. It was located on the south side of present day County Road 1050 South approximately three-eighths of a mile east of Baum's Bridge Road. 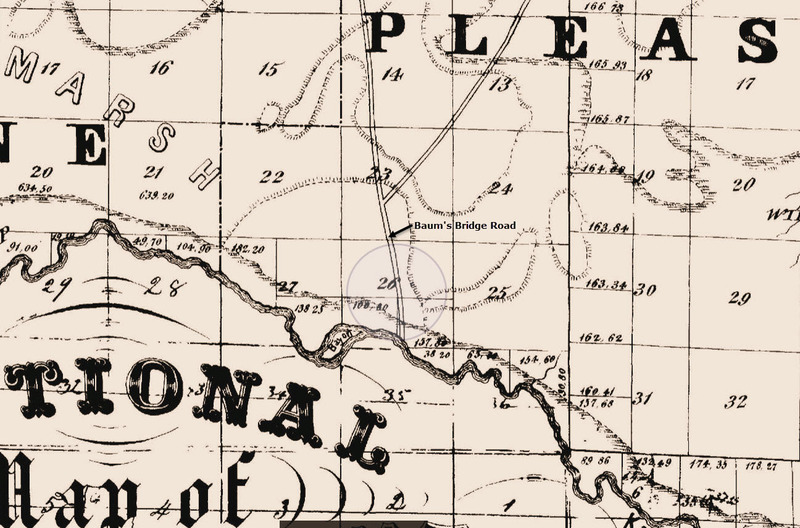 The 1895 plat map designates this school as School District Number 9 of Pleasant Township. In 1895, the school was surrounded by the Betterton farm, while the 1906 plat map indicates that G. Benkie owned the land surrounding the school. Research has been unsuccessful in determining the name of this school; however, it may have been referred to as the Mayville School since it was very near that community. 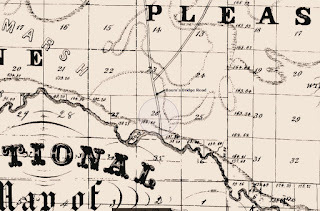 Neither the 1876 nor 1921 plat maps of Pleasant Township show the existence of this school, which suggests that it may have been in operation for only a few decades. Mrs. James Bonesteel, who bought the land that contains the cemetery known in one part as Boot Hill and another as God's Half-Acre, generously permitted the continued use of the site for burials. For years it was known as little Widow Bonesteel's burial ground. The watchers [Jasper County Rangers] let them get going [chopping down] on a big oak tree -- and three cracks from accurate rifles ended their career. Three notorious timber-crooks paid the inevitable penalty. No one ever tried to find out who they were or where they came from. Nobody searched their clothes for any marks of identification. Nobody cared. The ditching machines came, and piled a great heap of muck all over the old burial site. I [the column purposely does not identify this individual] don't know exactly where it was. Everything has changed so much since they drained the river flats. If I were to make a guess I'd say it was on the old Ault place. The Hydes settled on Lone Tree Island. During their period of residence there they lost three children by swamp fever and they were buried on the island. The Sherwoods had lost their son, Jeremiah, previously, and had buried him on the Widow Bonesteel's farm [at Mayville], where she had permitted the location of a community cemetery. 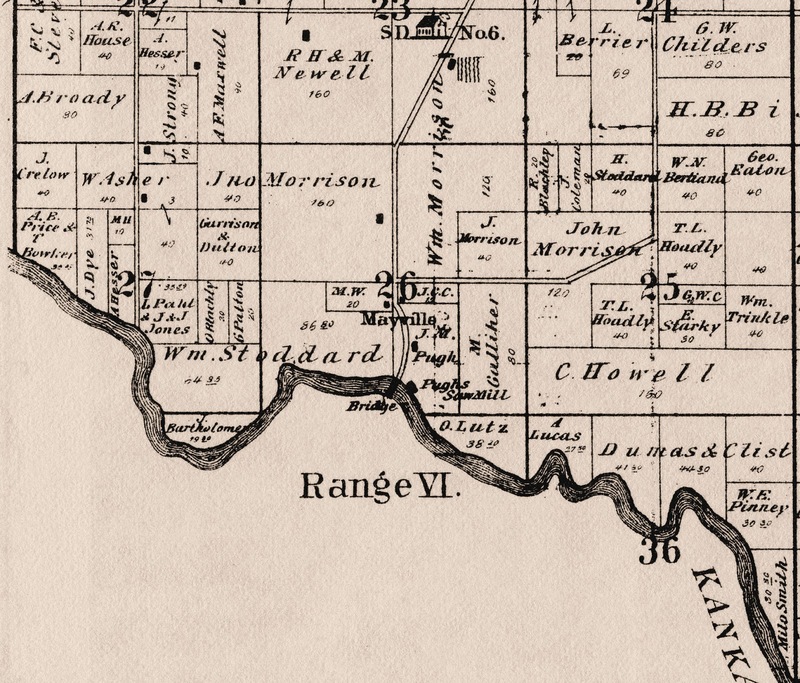 But the Hyde children couldn't be taken over the water-covered prairie, so the first cemeteries are recorded as "Widow Bonesteel's" and "Hyde's Cemetery." Hiram Hyde was born in October 1834 in New York. He served as a private in Company I of the 20th Indiana Infantry and was captured on the Union gunboat Fanny at the Union Army outpost Chicamacomico north of Cape Hatteras on October 1, 1861, and held as a prisoner of war. He would be released and discharged from military service on May 22, 1862. The 1880 Federal Census for Pleasant Township reveals that Hiram was a divorced 46 year old male. He was residing as a boarder in the John Dutton residence. The 1880 Federal Census records for Granby, Newton County, Missouri, show that Marion Hyde (age 43 years and divorced) and Grant Hyde (age 16) were living as boarders with the Frank Lucas family. The records of the 1900 Federal Census for Pleasant Township show that Hiram was residing as a 65 year old boarder at the residence of Louis and Freda Mott; his occupation is listed as a teacher. Neither Widow Bonesteel's Cemetery, with its God's Half-Acre and Boot Hill sections, nor the Hyde Cemetery can be found. Lone Tree Island is gone. While several individuals are believed to have been buried in Widow Bonesteel's Cemetery, only one burial is known for certain, which is Jeremiah Sherwood, the son of Jerry Sherwood. Like Mayville when it became deserted, the two burial grounds were eventually lost to the march of time. Mayville, 1909. Baum's Bridge is visible to the left. northwest toward the Porter County side of the Kankakee River. Oxford, Lee Thomas. 2013. The Civil War on Hatteras" The Chicamacomico Affair and the Capture of the US Gunboat Fanny. Charleston, South Carolina: The History Press. 256 p.
Werich, Jacob Lorenzo. 1920. Pioneer Hunters of the Kankakee. Logansport, Indiana: Chronicle Printing Company. 197 p. [pp. 99-100, 104-106, 195]. Practical Observer, Valparaiso, Porter County, Indiana; October 4, 1852; Volume 4, Number 10, Page 2, Column 5. Porter County Vidette, Valparaiso, Porter County, Indiana; May 20, 1875; Volume 19, Number 20, Page 3, Column 5. Column titled "Koutts Station Items." Porter County Vidette, Valparaiso, Porter County, Indiana; August 26, 1875; Volume 19, Number 34, Page 2, Column 6. Column titled "Obituary." Porter County Vidette, Valparaiso, Porter County, Indiana; December 28, 1876; Volume 20, Number 52, Page 3, Column 7. Column titled "Died. Malone. "Porter County Vidette, Valparaiso, Porter County, Indiana; March 8, 1877; Volume 21, Number 10, Page 3, Column 9. Column titled "Mayville Items." Porter County Vidette, Valparaiso, Porter County, Indiana; June 7, 1877; Volume 21, Number 23, Page 3, Column 8. The Tribune, Chesterton, Porter County, Indiana; June 18, 1885; Volume 2, Number 12, Page 1, Column 6. Column titled "Died." Lafayette Journal and Courier, Lafayette, Tippecanoe County, Indiana; August 10, 1925; Volume 187, Number 6, Page 4, Column 1 . Column titled "Land Mark To Go." The Vidette-Messenger, Valparaiso, Porter County, Indiana; August 18, 1936; Volume 10, Section 3, Pages 13-14. Column titled "Kouts High School History of Pleasant Township. As Compiled By History Class and Instructors For The Vidette-Messenger." The Vidette-Messenger, Valparaiso, Porter County, Indiana; January 15, 1958; Volume 31, Number 163, Page 1, Column 5 and Page 6, Column 3. Column titled "Weird Night Is Spent In River Shack," by The Stroller (William O. Wallace). The Vidette-Messenger, Valparaiso, Porter County, Indiana; June 28, 1958; Volume 31, Number 303, Page 1, Column 1 and Page 2, Column 5. Column titled "Tree Thefts Halted By Fast Action," by The Stroller (William O. Wallace). The Vidette-Messenger, Valparaiso, Porter County, Indiana; April 10, 1962; Volume 35, Number 236, Page 1, Columns 7-8 and Page 5, Columns 1-2. Column titled "Angry Preacher -- 'Old Man Bray' -- Leaves Indiana," by The Stroller (William O. Wallace). The Vidette-Messenger, Valparaiso, Porter County, Indiana; September 1, 1965; Volume 39, Number 50, Page 8, Columns 1-5 (Kouts Centennial Edition). Column titled "Pleasant Township's Early History Vague." 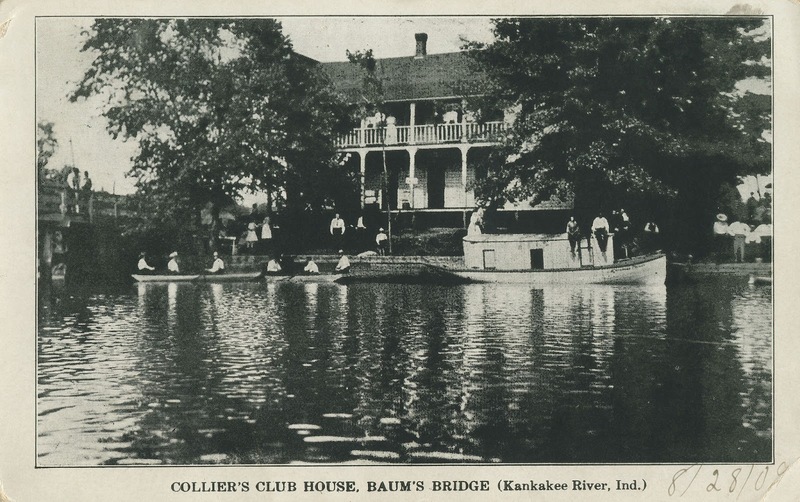 The Times, Munster, Lake County, Indiana; April 19, 2013; Column titled "Story of Baum's Bridge Begins in Prehistoric Times," by John Hodson. The Post-Tribune, Gary, Lake County, Indiana; May 24, 2016; Column titled "Lodge's History to be Rebuilt in Restoration," by Amy Lavalley. I think this blog you publish is really great! Would you happen to know anything about the Northern Indiana Normal School at Valparaiso? In my ancestors biographical sketch it reads: "Charles J. Cole whose name introduces this record, obtained his early education in the country schools of Cass county, Michigan, and in the years 1853 and 1854 was a student in the Northern Indiana Normal School at Valparaiso, Indiana. He lived with his mother and stepfather until they removed to Iowa." I'm guessing there probably wouldn't be any records for that school since it was so long ago but may as well ask. Thank you for the kind remark about the blog. The Northern Indiana Normal School was the precursor to present-day Valparaiso University. The Normal School existed between 1873 and 1900, when the name was changed to Valparaiso College. In 1906, Valparaiso College was renamed Valparaiso University. You indicate that Charles Cole attended the Northern Indiana Normal School in 1853 and 1854. Either the biography printed the incorrect dates or perhaps you read it incorrectly since the school did not yet exist in 1853/54?